Craving a sinful treat for breakfast? 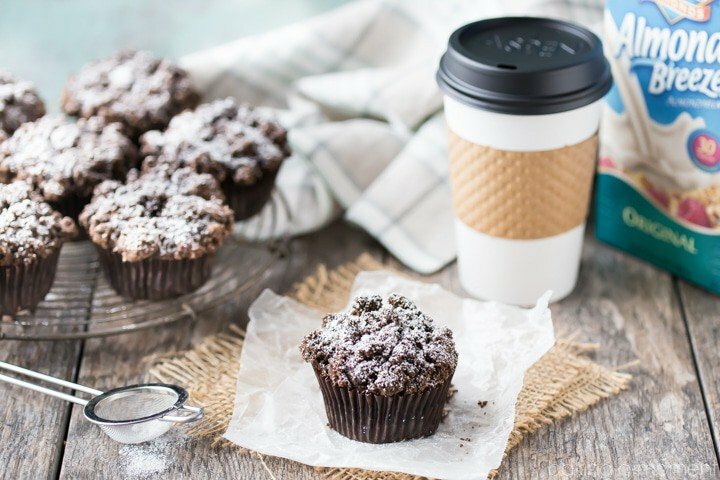 Look no further than these Double Chocolate Crumb Muffins! Moist, rich, and studded throughout with melt-y chocolate chips, with a crunchy chocolate streusel crumb topping. Enjoy these AND keep your New Year’s resolutions- they’re whole-wheat, dairy-free, and vegan! Happy Friday everyone! I just wanted to check in and see how you all are doing with your New Year’s resolutions. I hope I didn’t just make you groan. You may remember, my main resolution this year was just to enjoy life more. But I’m also a lot like everyone else, and eating healthier and getting more fit is always at the top of my list of goals too. I’ve been working hard at the getting fit part, trying to carve a little time out each day to spend on exercise. If it’s not too freezing cold outside, I’ll go for a 30-minute walk. On the really cold days I do a little online workout thing. It’s good for me to get the blood flowing and think about something other than work for a short time. And most of the time, it helps me to feel more energetic throughout the day. 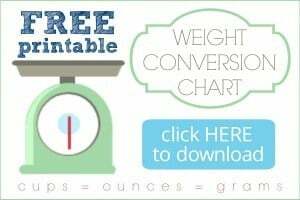 When I’ve been good and logged my workout, I really don’t want to mess it up by eating foods that are bad for me. But you know me and my sweet tooth! Sometimes the cravings are strong and the struggle is real. So it was really necessary for me to create something that satisfies them without completely derailing me from my goals. 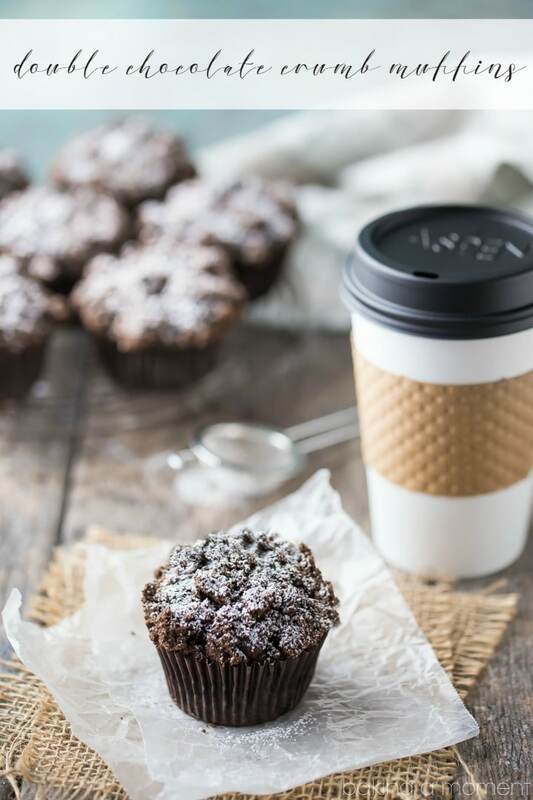 These muffins may look sinful, but believe it or not, they’re made with whole grains and they’re totally vegan. That’s right, no dairy, no egg. It’s amazing to me that this is even possible, lol! But it’s as simple as swapping out the all-purpose flour for whole wheat pastry flour, butter for coconut oil, egg for flax, and my usual Greek yogurt for Almond Breeze Almondmilk Original Unsweetened. For the most part, this recipe goes like any other muffin recipe I have on my blog. But I will admit, I had to test it five times before I felt I really had it right. It wasn’t so much the proportion of ingredients that was giving me trouble- it was the order they go in. Unlike many of my recipes, this one doesn’t work if you just dump and stir. So please be sure and follow the steps the way they are listed! 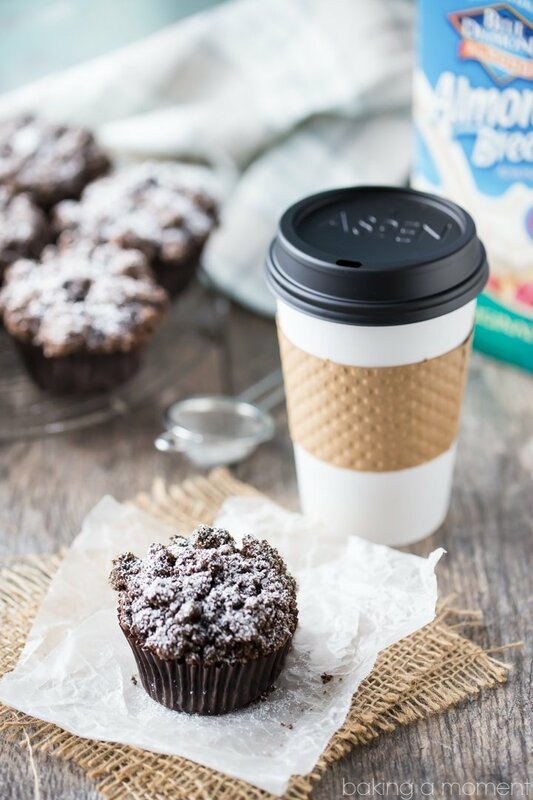 Having these muffins around is a great way to bust those cravings! And they’re so good with your morning coffee. So whip up a batch and enjoy them all throughout the week! Craving a sinful treat for breakfast? 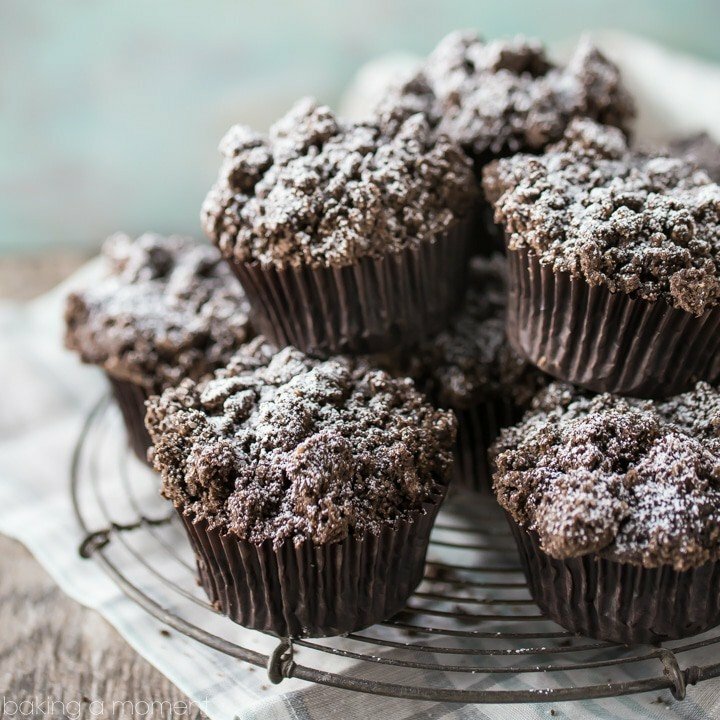 Look no further than these Double Chocolate Crumb Muffins! Moist, rich, and studded throughout with melt-y chocolate chips, with a crunchy chocolate streusel crumb topping. Enjoy these AND keep your New Year's resolutions- they're whole-wheat, dairy-free, and vegan! Place the coconut oil in a small bowl and microwave to melt. (On my microwave, this takes about 90 seconds on 40% power.) Set aside. Place the flour, sugar, cocoa, and salt in a medium bowl and stir to combine. Pour in the melted coconut oil and toss together with a fork until crumbly. Preheat the oven to 425 degrees F, and line a muffin tin with papers. Place the ground flax seed and water in a small bowl and set aside. Place the coconut oil in a small bowl and microwave to melt. (On my microwave, this takes about 90 seconds on 40% power. Set aside. Place the flour, cocoa powder, baking powder, salt, and chocolate chips in a large bowl and stir to combine. Place the Blue Diamond Almond Breeze Almondmilk in a large liquid measure, and stir in the sugar and extracts. Stir in the flax mixture, and pour the liquid into the dry ingredients. Stir together briefly, until just a few streaks of flour remain. Pour in the coconut oil and stir together until just combined. The batter will be lumpy. Fill each well of the muffin tin about 2/3 full, and top with the reserved streusel. Bake for 5 minutes at 425 degrees F, then turn the oven temperature down to 350 degrees F (without opening the oven door), and continue to bake for another 25-30 minutes, or until a bamboo skewer inserted in the thickest part of a muffin comes out clean. Cool completely and dust with powdered sugar, for garnish. These look so tantalizing! Luckily they’re on the healthy side, since I don’t think I’ll be able to stop after just one. As far as New Year’s resolutions go, I decided to focus on my dog’s health and to brush her teeth more regularly. So far so good! These look great, but seems like it should make more than a dozen. I have never seen a streusel with this much flour. I don’t like to be skimpy with the streusel! It makes a good amount. Also the coconut oil is very dense so you need a little more flour. Otherwise it just turns to goo in the oven. Gooey muffin = not a good muffin. Thanks for reading, Charlotte! Yes!!! I love coffee and chocolate together- it’s the best combo! Thanks so much! Allie these look so delicious! That crumb topping!! I think I could eat it right out of the bowl! Hello, Allie! These look SO sinful – it’s hard to believe that they’ve got nothing bad in them. Absolutely perfect for January resolutions. I’ll take five and that cup of coffee in your photos, please! I didn’t make any resolutions this year… so mine are going quite swimmingly! 🙂 I did make some small goals for myself, and those are going okay so far. Time to reward myself with some of these fabulous muffins!! These look seriously delicious, Allie! LOVING that chocolate crumb topping, because yet to crumbly toppings on EVERYTHING. Pinned! Cheers, my dear! *yes to. Auto Correct is a serious buzz kill. I LOVE muffins, especially big fat chocolate ones. These look amazing Allie – LOVE that gorgeous crumb! Pinned! Thank you so much Jess! Any excuse to have chocolate for breakfast, right??? Today more than ever I want to be your friend. 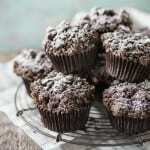 There is no better muffin than double chocolate! YUM! Lol you’re too funny Melanie! I am so with you though- double chocolate all the way! Hi! Muffins are delicious ! But the crumb topping wasn’t “crumby” it was floury and just kind of falls of when you touch it. How do I get the crumby texture? More coconut oil? Sure Claire, you could either do more oil or less flour- totally up to you! I kind of squeezed it together with my fingers to form clumps, but I know that different brands of cocoa often have different amounts of fat so perhaps your cocoa was drier than mine? Sorry it wasn’t more to your liking but hopefully next time it will come out better. Thanks dear!